Can you believe it? It’s 2012! The bad news is that we’re already seeing a plethora of Massachusetts car accidents. According to ABC5, icy Massachusetts highways contributed to numerous rollover accidents, including a 16-vehicle accident. Road conditions can be a top cause in many local car accidents, but these incidents are ultimately preventable with safe, cautious and alert driving practices. 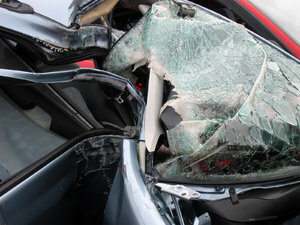 Our Boston car accident lawyers understand that 2012 serves as a time for everyone to start over fresh. So say goodbye to 2011 and hello to safer roadways. Let’s all make a New Year’s resolution to practice safer driving habits to help to reduce the number of fatal accidents in our state. The first step to safer roadways starts with you. The first of the New Year’s traffic accidents happened in Pelham. In this accident, which took place at roughly 12:00 a.m., a 32-year-old driver was thrown from a SUV after losing control of the vehicle on an icy road, causing the vehicle to flip over. This accident happened on Route 202. The driver was taken to the Bay State Medical Center in Springfield where later pronounced dead. A second rollover accident happened in North Reading just hours later, just after 6:00 a.m. on Route 128. A 23-year-old passenger of the flipped vehicle was taken to a local hospital after this accident. The driver reportedly fled the scene. The accident is being investigated. Even more accidents happened when near-freezing temperatures and rain gave the roadways an icy sheen. Numerous traffic accidents were reported throughout central Massachusetts during these slick and cold weather conditions. Officers report that there was a solid three hours of back to back accidents during this time. Law enforcement officers report that the worst of the accidents happened in Templeton just before 8:00 a.m. Reports indicate that a couple in their 30s was trapped inside their vehicle after a rollover accident in Route 2. Both were taken to the hospital. The madness didn’t stop there. There was also a 16-vehicle accident that happened in Millbury on Route 146. There was yet another accident in Worcester on I-290. The Massachusetts State Police report that there were also a number of accidents in West Boylston on I-190 by the Quinapoxett Bridge. Officers say that the icy conditions appear to be the cause of the accidents, according to the Worcester Telegram & Gazette. We ask that everyone be safe on our roadways as we start 2012. Winter weather is sure to plague our roadways, making driving very dangerous. Please, start the New Year off right and make a conscious effort to navigate our roadways safely. Our roadways are still congested with the remainder of the holiday traffic. Be alert and cautious when driving, especially with the snowy and icy weather conditions. Have a safe and Happy 2012 and safe travels! If you or a loved one has been injured in a traffic accident in Massachusetts, contact Boston Injury Attorney Jeffrey S. Glassman. Our law firm offers free and confidential appointments to discuss the rights of car accident victims. Call 877-617-5333.